PM Netanyahu and many other senior Israeli politicians mourned the slaying of Ari Fuld, a father of 4, outside a shopping center. 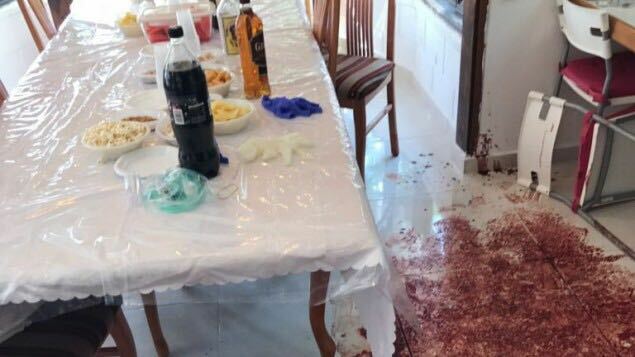 Fuld, who lived in Efrat, was killed by a Palestinian-Arab terrorist. Palestinian-Arab terrorism is often “justified” by using “illegal settlement” rhetoric. This is the case even in English- language publications and possibly even more so in Arab language statements not analyzed herein. It seems that some Palestinian-Arabs feel that they are entitled to kill “illegal settlers”. See Appendix A below, with quotes from Arab public figures suggesting, and sometimes strongly implying, that it is acceptable to kill “illegal” settlers, and related quotes. See Appendix B, with 3 quotes about Efrat being an “illegal settlement” — all from last month. Fuld who died this week, was a resident of “illegal” Efrat. Despite the risk to hundreds of thousands of civilian “settlers”, like Fuld who died this week, and including children, the Western world continues to condone or even disseminate “illegal settler” rhetoric, to varying degrees. As is well known, the European Union uses “illegal settlement” language frequently, as a major motif. The same is true of the United Nations. At least one agency in the United States Government remains committed to “illegal settlement” positions. Prominent Americans (and Israelis) have expressed concern and indignation about this situation for many years, including to the present (Trump) administration. The situation has not yet been taken up by the Trump administration. Israel’s Ministry of Foreign Affairs, its embassies and consulates, the Government Press Office and, most recently, the Ministry for Jerusalem Affairs explicitly reject the “illegal settlement” concept. Their position is backed by an official Government of Israel decision voted upon pursuant to the Levy report by Supreme Court Justice Edmond Levy and others which stated settlements are legal. Israel’s Deputy Minister of Foreign Affairs Danny Ayalon began refuting “settlement illegality” rhetoric as early as 2011 (https://www.facebook.com/DannyAyalon). Senior experts in international law support Israel’s position that settlements are legal. Any sovereign state has the full sovereign right to hold by any legal approach within the spectrum of respectability. Therefore, there is no question that Israel has the right to hold that settlements are fully legal. Similarly, there is no question that Western countries can and should abandon their unhelpful and dangerous “settlement illegality” rhetoric. Quotes (Abbreviated) from Arab sources suggesting it is acceptable to kill “illegal” settlers, and related quotes. DAMASCUS, SYRIA (11:50 P.M)- Palestinian resistance fighters fired upon a Israeli settler shuttle bus, killing a 35 year old, well known settler. at City University of New York (CUNY), for the 2016-2017 academic year. Nijem is a sophomore at John Jay, majoring in Law and Society. “by international law, we have the right to conduct any form of resistance. I’m telling you that there must not be bus bombings in Tel Aviv. But we have 400,000 settlers. What are these people doing among us? According to International Law, it is clear that Israeli settlers illegally occupy the land on which they live. Regardless of whether it was their own initiative to participate in illegal colonies or not, the settlers are committing a crime. The key question is; are settlers, who are actively committing a crime, to be classed as a “civilian”? If illegal settlers inside the West Bank, are Palestinians to be condemned for violent acts of resistance against settlers? Recent decisions passed by the Israeli Occupation (which) have accelerated the building of illegal Israeli settlements and formation of an administrative council for illegal settlers will lead to dire consequences. Hamas calls upon the Palestinian people to confront and thwart the schemes of the Israeli Occupation with all possible means. What if your family’s ancestral olive groves were burned by illegal settlers? Would you fire rockets at their iron dome? We choose resistance, always, in all its forms. Palestinian protesters in east Jerusalem are angry at the illegal settlers in the neighborhood of Silwan. Jibril Rajoub said that the illegal settlements will “lead to an explosion,” speaking from Ramallah. Walid Obeidat, said that peace would be threatened by Jewish settlement (because” “All such acts are incompatible with international law and if allowed to continue will ultimately imperil the treaty” . Your illegal settlers are ensuring facts on the ground. We have nothing left to do but to fight. Palestinian Liberation Organization (PLO) Tuesday issued a report on the Israeli Annexation Wall. The report started off by noting the illegitimacy of the Wall pointing out that it allegedly protects illegal settlers. The Socialist Alliance recognises the ongoing resistance of Palestinians to the Israeli occupation until it meets its obligations under international law. illegal settlers have opted to colonise Palestinian land If settler children are “exposed to grave injuries”, clarify the Israeli state’s culpability, while placing accountability for protection upon the same political actors. The Army regularly invade Azzun, accusing young boys of throwing stones on the road at illegal settlers. SFP will continue to support all prisoners. We kindly ask all our international friends to maintain pressure on their respective representatives to hold Apartheid Israel responsible for its war crimes, particularly the illegal imprisonment of Palestinian prisoners. it should not be extended to kidnapping Gilad Schalit or attacks against uniformed soldiers and policemen. “We do not consider that acts of terror, because the victims were in uniform”. “The fact that she lives in [the settlement of] Otniel blurs the lines”Opall-Rome continued. A male adult Palestinian-Arab terrorist stabbed Shuva Malka, an Israeli high-school girl, less than 5 feet tall, studying for an exam at a bus-stop, because she “looked like a settler”. Diminutive Shuva took to her heels but the male adult terrorist chased her with determination and stabbed her 9 times from the back, each time barely missing her essential organs (heart and lungs). Quotes (Abbreviated) presenting Efrat as an “illegal settlement” — all from last month. Fuld, father of 4 who was killed this week, was a resident of “illegal” (sic) Efrat. Israel had also approved 106 new settlement units for the illegal settlement of Efrat, on Monday. Former governor laid bricks and spread cement with other Israeli officials Wednesday for the construction of new housing units in the illegal settlement of Efrat. For the time being they are coming for settlers – will we speak out about deadly “settlement illegality” justifications? And will President Trump be brave enough and caring enough to put a stop to deadly “settlement illegality” justifications? Contact mattot.arim@gmail.com if you are a person of determination – who can help. For example, sending this to a friend, is definitely a way to help.